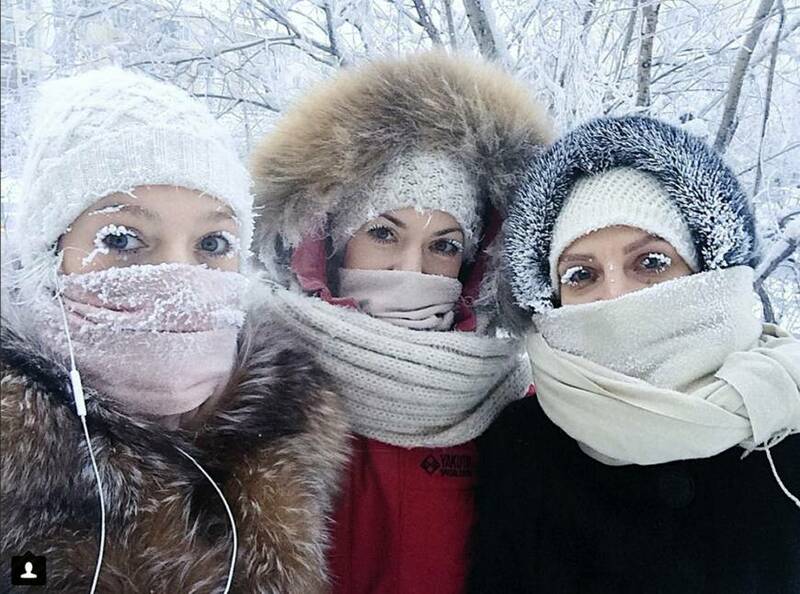 Anastasia Gruzdeva (left) poses for a selfie with her friends as the temperature dropped to about minus 50 degrees (minus 58 degrees Fahrenheit) in Yakutsk, Russia, Sunday. Temperatures in the remote, diamond-rich Russian region of Yakutia have dropped to near-record lows, plunging to minus 67 degrees Centigrade (minus 88.6 degrees Fahrenheit) in some areas. MOSCOW – People living in some of the coldest places on Earth are hunkering down as temperatures fall to near-record lows that are even defeating thermometers. Temperatures in the remote, diamond-rich Russian region of Yakutia on Tuesday plunged to minus 67 degrees Celsius (minus 88.6 degrees Fahrenheit) in some areas. In Yakutia — about 3,300 miles (5,300 km) east of Moscow — where students routinely go to school in minus 40 degrees, school was canceled throughout the region. Local police also ordered parents to keep their children at home. Over the weekend, two men froze to death when they tried to walk to a nearby farm after their car broke down. Three other men who were with them survived because they were wearing warmer clothes, local investigators reported on Monday. The press office of Yakutia’s governor said Tuesday all households and businesses in the region have working central heating and access to backup power generators.